Why the 2018 Tesla Model 3? Handling is super sharp. It reminds me of a 2017 Cayman I drove. There are three steering modes: comfort, standard, and sport. Comfort is too light and twitchy and standard is perfect. Sport is only good if you are on a twisty road or like a heavy steering. The Continental ProContact tires are very grippy on dry pavement. Combined with the quick acceleration, it is easily the most fun compact sport sedan on the market. It has the thickest steering wheel I've ever felt in a car. The car feels incredibly stable because it has a low center of gravity and the tires are wide. The 12 way power driver and passenger seats are very comfortable and the side bolstering is just right. The "vegan leather" in the car feels softer than real leather. I don't know how well it will hold up. My Prius has another type of this leather and that driver's seat has held up better than any leather seat I've sat in. Possibly the best part of any Tesla is that over the air updates happen constantly. They fix bugs and add new features to the car. Tesla owners can tweet Elon Musk and ask for more features all of the suggestions so far have been possible due to the fact that Tesla future-proofed their car by including hardware for future features before they roll out as a software update. Everything in the car is controlled by the screen except the hazards, windows, and seat controls. Even the side mirrors and steering wheel are controlled through the screen, and some of the features can be controlled through the two steering wheel knobs. 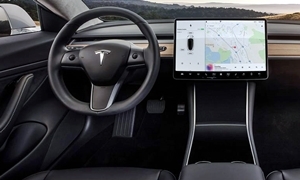 The way Tesla designed the infotainment system's layout is intuitive, but there are still some actions that drivers need to perform quicker because I feel like I have to take my eyes off the road for one second too long to close a menu. It doesn't seem like there would be a way around this, however. If you are not tech-savvy, do not buy this car. It isn't hard to use, but there are way to many features on the car that will blow people's minds if you aren't. The navigation is Google Maps and is probably the best in-dash navigation on the market, especially on this 15" screen. The screen is bright enough in direct sunlight (auto-dimming). Speaking of sunlight, the roof is all glass except for the small 3" wide support beam that crosses the middle. I was worried that this would be a deal breaker because in SoCal it gets sunny and hot. Fortunately, it is perfectly tinted and is beautiful. It is one of my favorite features in the car. I opted for Autopilot and despite the crashes you hear in the news, the drivers are never holding the steering wheel. You are supposed to hold the steering wheel. It has worked very well for me, even on a curved 2-lane highway. Tesla is pushing out software updates every few weeks and is decreasing the amount of time you can take your hand off the wheel. I think it is around 15 seconds now. The amount of technology in the car is probably the best part about it. It feels like more of a gadget than a car, and that is because it is. We really like the interior styling. It is simplistic, but I think it will age well over the next 10 years. I wanted to wait for the white interior, but that is coming later this year. The black seats get hot quickly and don't look as good. The piano black plastic on the center console is high quality, but scratches easily. Why Not the 2018 Tesla Model 3? The back seat cushion is too low, which means there is no thigh support and your knees are level with your chest. There is also no foot room, but there is enough leg room. The rest of the backseat is comfortable, but the lack of foot room and low cushion are annoying. Teslas are some of the most expensive cars to insure. The rear trunk is spacious for a Sedan. The frunk is small and the hood for the trunk is very hard to close. It may be broken, but I have to put most of my weight into the hood to latch it into place. I haven't used the frunk since we got the car for this reason. It is an afterthought. They market it as being a $35k affordable car, but obviously they start with producing the most expensive model. Currently, you have to buy the Long Range ($9k) with the Premium Package ($5k). So you have a $49k car to start with. We wanted the $1,500 upgrade wheels and the Autopilot ($5k), so the final price was over $56k. After rebates, it is $46k. If you wait until Tesla produces 200,000 cars, you'll lose the rebate, so it is worth it to buy the fully loaded model now instead of waiting. 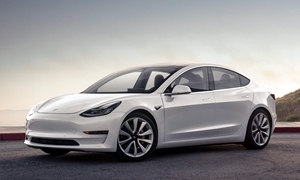 They are selling quickly; the Model 3 outsold the Mercedes C-Class and BMW 3 series in California. The build quality on the Model 3s are very good now. There are no panel gaps on ours and the interior is put together very well. The earlier ones had some unacceptable panel gaps and paint mismatches. The ride is smooth, but firm. It is perfect in this car because it helps handling and is still comfortable as a daily driver. Even with the 19" wheels, the ride is smooth. In February, Tesla retuned the suspension and increased ride quality in response to the Consumer Reports criticism. The interior is pretty quiet. There is some wind noise on the freeway, but it isn't annoying. I think it would match a BMW 3 series, but a C Class or A4 would probably be quieter. Of course, when accelerating the Tesla is quieter than all of them. Tire noise is almost non-existant, surprising given the low profile tires. Congrats on the new car! I'd forgotten you were getting a Model 3 (if I ever knew). Thanks for posting this review. It does look like part of it got center-justified. Let me know if you can't fix this with editing. Also, any chance of additional pics? Thanks! I tried pushing it to the left, but I couldn't find the button to do that. Also, I uploaded 7 or 8 pictures and only the two interior pictures show up. There are two boxes with a small "?" where the pictures should be I think. I'll try again. I uploaded pictures to the "photos" section of the website and there was a duplicate. I also decreased the file size to around 500KB from 3 MB and tried (if that makes a difference). It still didn't work. Yeah, make sure you get the latest updates as Consumer Reports has found out they are quick to fix something like longer than average braking that should have never left the proven ground test track. The tear down said the suspension down is very good. But upward is a joke and more like kit car or rush job by Musk. Sorry for the trouble. What resolution are the photos? I used to size mine 700x420, and then I could upload 20 at once. Sizing them 1500x900 I think the limit is around six at a time. On the justification, I've seen this before, can't remember the cause. Was the text pasted in from somewhere else? Originally they were 4032 x 3024, then decreased to 1440 x 1080. I got one of the exterior photos to show at 1080. I'll size them all smaller. I wrote it all myself, not pasted from somewhere else. It looks like I did though in that one part though. Norm, the Munro tear down was performed on a 2017 car. Since then, they have changed the car a lot. It has new seats and they are using different materials to put the car together. It used to have a more firm suspension, but they tuned it to be more soft (in response to CR). They are using a new windshield with the 2018 cars to improve sound insulation. That video (and website) was sponsored by ExxonMobil, so I understand why they are not happy that EVs are the future. I uploaded 1024 x 768 and it is the same pictures that show up. Maybe it has to refresh so I'll wait. I got three pictures up there which is good enough.